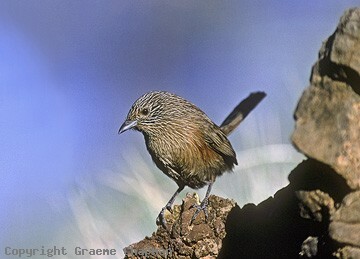 Dusky Grasswrens are birds of the rocky ranges of the red centre. Most people head for Alice Springs to see them where they occur within easy reach of the town but are not always easy to see! Invariably associated with rocky environments from the Everard Ra. 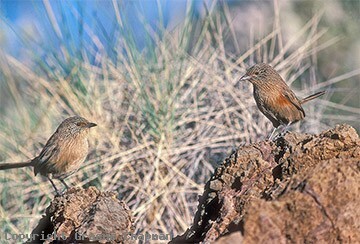 in S.A. north to the Ashburton Range just north of Tennant Creek, Dusky Grasswrens might be better known as Rock Wrens. By contrast, Thick-billed Grasswrens inhabit mainly saltbush down on the flats and drainage lines and these days, they barely make it over the SA/NT border near New Crown Station so there is less chance of confusion. 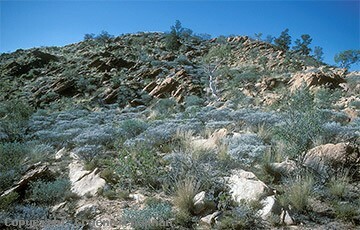 These pictures were taken at Serpentine Gorge west of Alice Springs in the Macdonnell Ra. Maybe a result of the rocky environment, their calls seem to be louder and easier to hear than some other grasswrens and I found them easily on the slopes above the car park. Other popular tourist venues where they are often seen include Simpson's Gap near Alice Springs, Kings Canyon and in boulder strewn parts of the Harts Range (511204). Females can easily be distinguished from males by the chestnut patch on the flanks. If you are short of time and really want to see them at close range, they are well displayed at the excellent Alice Springs Desert Park. There was a lot of confusion in the past over the status of Dusky and Thick-billed Grasswrens; they are both rather plain unmarked birds and at one stage they were regarded as a single species. Admittedly they lack distinctive markings, but the differences in habitat and particularly call, should have been sufficient to separate the two. 511201 ... Dusky Grassswren, male. 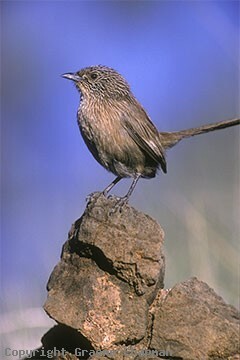 511202 ... Dusky Grasswren, female, with chestnut flanks. 511203 ... Adult pair, male left, female right. 511204 ... Rock strewn habitat in Harts Range, N.T. north-east of Alice Springs.